We were able to do a lot in the Bethesda Mission Hospital on West Borneo as volunteers in the technical department. Now we are in a big city called Yogyakarta on the island of Java in Indonesia to apply for a year visa so we can stay here longer. 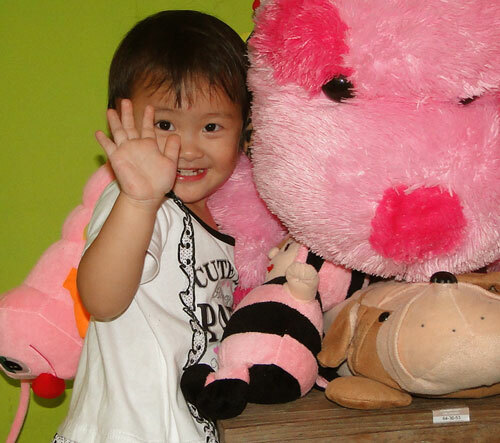 We also need to be able to show that we have had this visa to be able to adopt Sara after 2 years. On the picture above we are together with most of the people who help us with Sara. The lines are in blue color in the map. The last weeks in the Mission Hospital were very busy with last moment urgent repairs and also after a lightning strike damaged some devices. 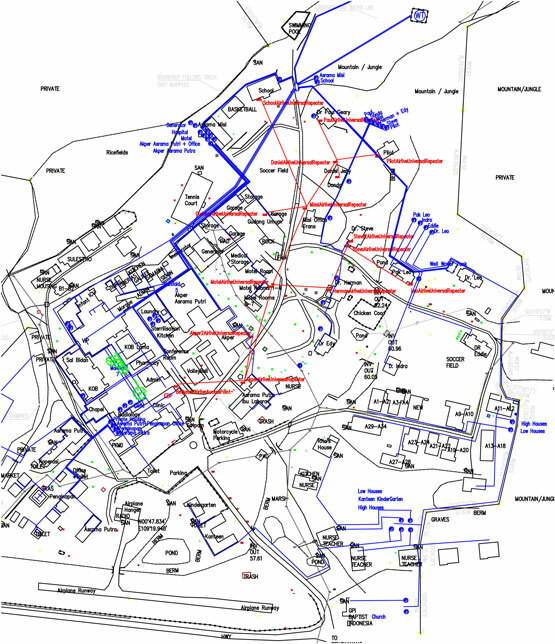 Here in Yogyakarta I will do some due work on the computer, like drawing the new waterlines into the map drawing of the Hospital on Borneo. This drawing will be very handy so anyone can see where they can find all the lines i.e. In the pictures below Sara is playing. 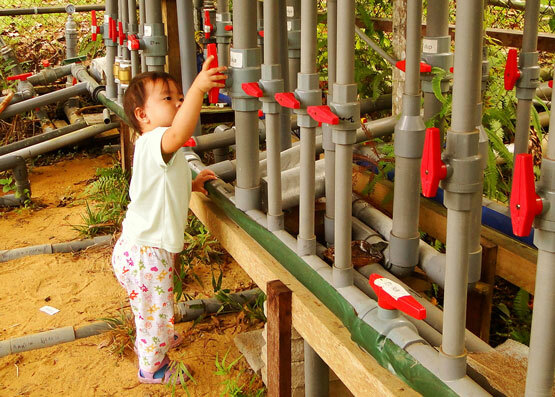 Sara loves to "help" with handling the valves for the water supply of the Hospital on Borneo. 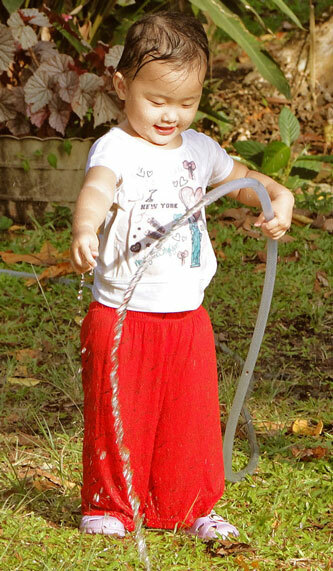 Sara loves to play with water. Now I also have some more time to work on the websites which I maintain for other Missionaries and making their newsletters. http://GeloofHoopEnLiefdeRwanda.nl a.o. 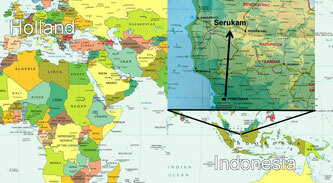 In France there will not be the big conference in the big tent this summer so we don�t have to go there to help and now we can stay longer in Indonesia. Sara likes it that we stay longer because she now realizes more and misses us when we are not with her. We want to be together as much as we can. In the picture Sara is with the nurses in the Maternity Ward of the Hospital where she was born 2 years ago where she survived all that she has gone through during her first month as a baby. Wherever we go, everybody likes Sara. She is intelligent and has the ability to learn words fast now. So we want to put in all effort so that Sara gets the best care. The cost to apply for the year visa is high in Indonesia. We pray for God His guidance and ask God to provide for all our needs so that we can continue with the adoption. We are praying for the year visa for which we still need 1000 Euro. 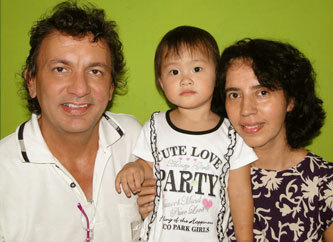 If you can help with this it will be a great blessing for us and the adoption process of Sara.